Auto-fills web-forms by a single click. Records and plays clicks on web-links. iNetFormFiller Tired of keeping in mind passwords and wasting your time filling countless web forms? Get rid of this inconvenience. Just put you personal data into a profile, and let iNetFormFiller do the rest. It would save you from all the routine operations and fill web-form of any complexity by one click. iNetFormFiller provides you with opportunity to edit web forms without loading them from the Net. When the needed form is called, iNetFormFiller shows it to you the same way it was display on the corresponding web site. The process of editing would be obvious and wouldn't differ a lot from working with online form in the Internet. iNetFormFiller identifies fields of any online forms and automatically fills them with appropriate data from profile. 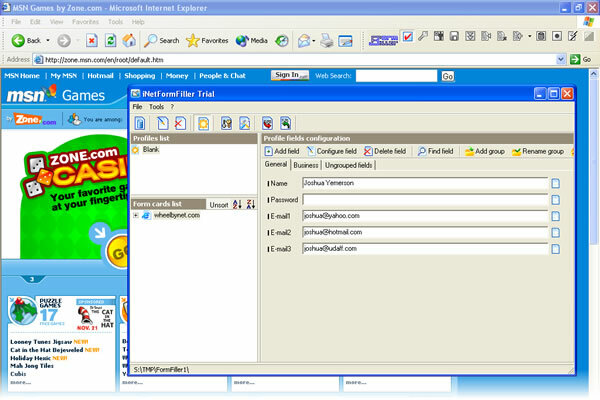 Due to flexible security system several users are given a possibility of working with iNetFormFiller on the same computer. At the same time each of the users can define what data should be accessible to other users, and what part of it should be protected by password. Filling forms of any complexity with one click. Availability of profiles, which allow you to fill forms depending on the topic chosen. Intellectual bind of user profiles fields to the fields of online forms. Possibility of intellectual identification of fields in online forms. Combined fields, based on two or more basic fields from user's profile. Possibility to edit already filled forms with ease without loading them from the internet. Protection from unauthorised review of your personal data. Reserve copy of your data. Export / Import of user profiles and form-cards. Possibility to create multiple data bases of formcards and profiles. iNetAdviser Professional - product makes your Internet surfing easier and faster!